Forces of Capital and the State, in all their licentiousness, same as their fascist dogs, are attacking spaces of subversion, germs of the new, self-organized free zones in which those kind of ideas and relationships are created and promoted that will overthrow the rule of slavery and demolish their rotten world. Obvious examples are the squats Villa Amalias, Skaramaga (both in Athens), Delta (in Thessaloniki) and others in Greece, or the ZAD in France. 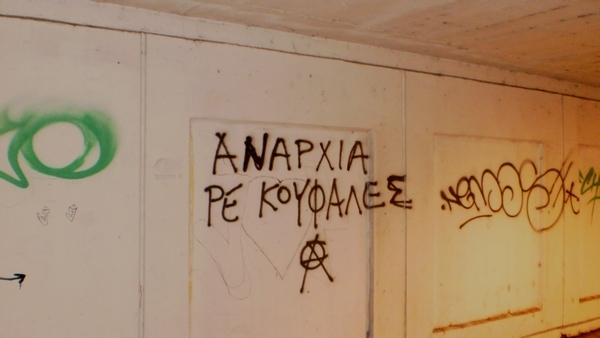 We send our solidarity to all squats and liberated spaces that have been under attack of Capital and the State, to the prisoner Spyros Dravilas, the four anarchists arrested in Kozani, comrades who have been persecuted or are in the clutches of the State, and to all those who are fighting and resisting oppression. No matter how hard they try, the spirit and fire of rebellion, the struggle for freedom will never be put out! 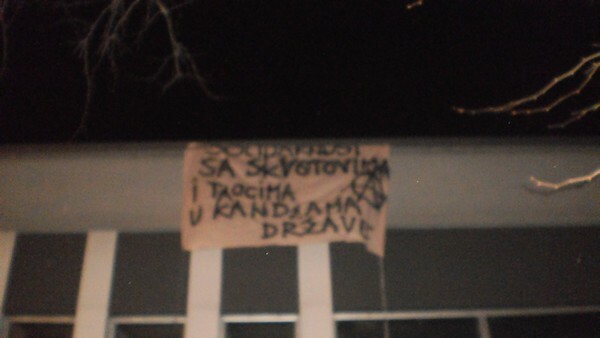 This entry was posted in Black February, Direct Action and tagged Belgrade, Greece, Serbia. Bookmark the permalink.